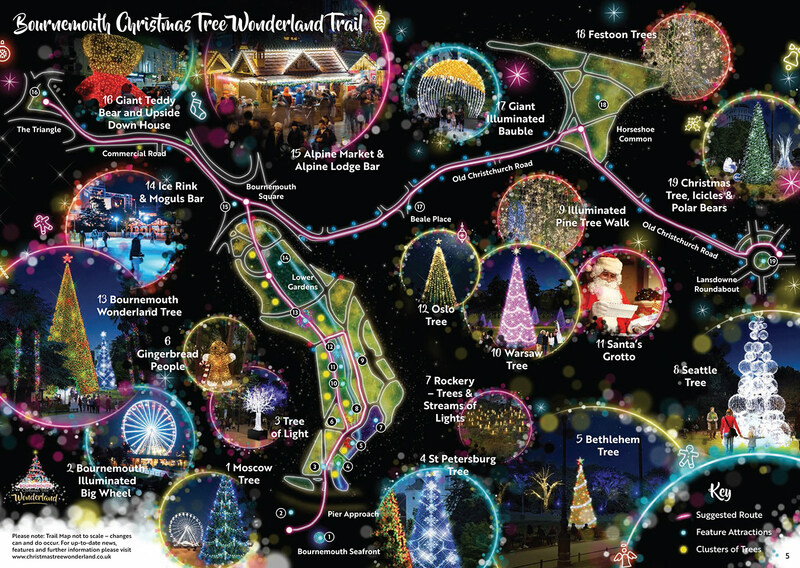 Spectacular Christmas tree trail, enchanting illuminations and seasonal family fun! Experience the magical spectacle of hundreds of glittering trees from around the world. See them shimmer against the night skies along our pine-scented walkways. Expore the Alpine Market and skate under the stars in our enchanting Victorian gardens. Enjoy live music, entertainment and illuminations around the resort. This Christmas, enter a world filled with light as trees guide you through an enchanted walkway encountering dazzling features and surprises along the way. From Bournemouth Seafront into the Lower Gardens, throughout the town centre and beyond to the coastal villages of Westbourne, Boscombe and Southbourne, explore a glimmering world of memorable seasonal fun for the whole family. Stay up-to-date, visit christmastreewonderland.co.uk to find out all the latest news, event updates and further information on shows, performances and great entertainment in Bournemouth and our coastal villages including retailers, restaurants, bars, entertainment venues, attractions, hotels and much, much more!